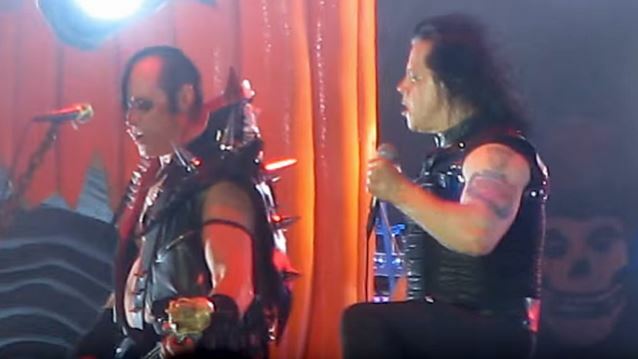 The classic-era lineup of the horror punk outfit MISFITS — Glenn Danzig, Jerry Only and Doyle Wolfgang Von Frankenstein — is planning to enforce a strict no-cellphone policy at its upcoming reunion shows in Los Angeles and Las Vegas. The AXS and Ticketmaster ticketing web sites have released an updated "phone policy" regarding the concerts, saying that: "No cellphones, smart watches, cameras or recording devices will be permitted during The Original Misfits reunion shows. These exclusive one-off performances will be completely phone-free. "Upon arrival at the venue, all phones and smart watches will be secured in Yondr cases that will be unlocked at the end of the show. Guests maintain possession of their phones throughout the night, and if needed, may access their phones at designated Yondr unlocking stations in the lobby. Anyone caught using a cellphone during the performance will be removed from the venue. We appreciate your cooperation in creating a phone-free viewing experience." Yondr's technology is intended to create a more organic, distraction-free concert experience. As the company says on its web site: "Yondr has a simple purpose: (To) show people how powerful a moment can be when we aren't focused on documenting or broadcasting it." "When you enter the space you show your ticket, your phone is placed in a Yondr case, the case locks, and once your phone is in there, it's handed right back to you, [so] you never lose possession," Graham Dugoni, who founded Yondr, told KXTV-TV. "If you're waiting for a call, that's no problem; you can keep your phone on vibrate so you'll feel it in your pocket or in your purse," he added. "You can step outside to the lobby and they'll unlock your phone there." 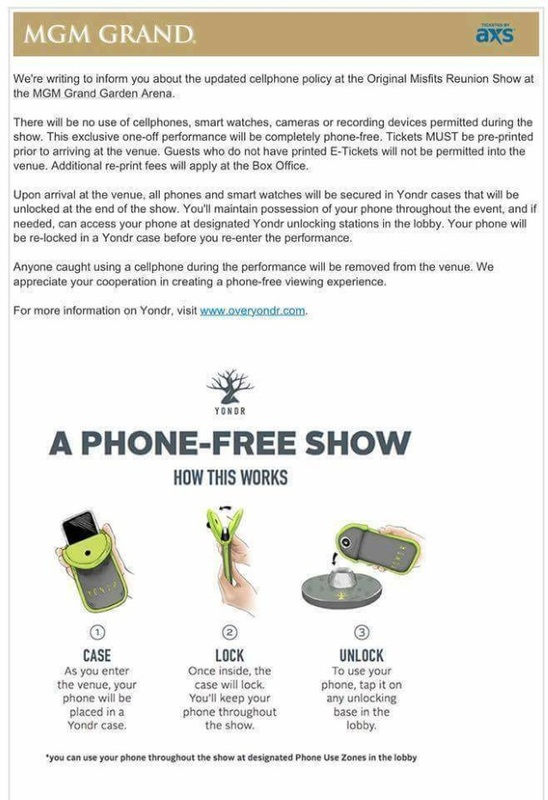 Other artists who have required the use of Yondr at concerts include GUNS N' ROSES, Alicia Keys, CAGE THE ELEPHANT and the comedian Dave Chappelle. MISFITS will perform at the MGM Grand Garden Arena in Las Vegas, Nevada on December 28 and at the Forum in Inglewood, California on December 30.